Rare breed and hard to find - combed top Light Grey Swalesdale - ordering by the ounce. This is a brown Jacob combed top. If you are familiar with Jacob sheep, you know they are usually multicolored. 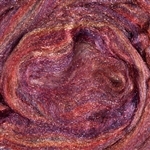 This is a top that is blends those multicolors all into one gorgeous brown. It's not super soft but it is a really nice fiber nonetheless. This fiber has a beautiful bluish-grey tone (natural) and is double coated. It felts well and gives bounce and strength. Merino spinning fiber- top - Natural Brown BFL Superwash (Blue Faced Leicester) white combed top . Rare breed and hard to find - combed top ecru Cheviot - ordering by the ounce. The staple length is anywhere from 3 to 5 inches. Fiber fineness can vary from fine to coarse. The micron count is 28-33. Fabulous Ashford produced Corriedale Roving in so many great colors. Sold by the ounce. Perfect for spinners and felters. This is being discontinued - get it while you can. This is yearling Mohair and is ever so nice. 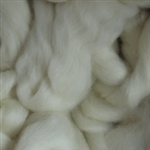 Mohair comes from Angora goats. It's got a nice wave to it. 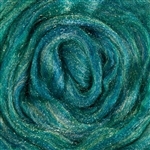 Some people find this fiber scratchy but regardless it has a gorgeous sheen and strength. use it as it is or blend it with another fiber to boost it's warmth and durability. 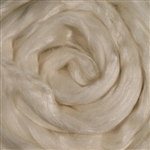 SOYSILK� brand fiber is made from the residue of soybeans from tofu manufacturing. The fluffy Spunky sheep on an oval 5.5" x 3.5" bumper sticker. Wonderful Ashland Bay Solid colored merino. Dyed and then combed into lovely easy to spin Combed top. Sold in 2 ounce bundles. BFL Blue Faced Leicester dark top . 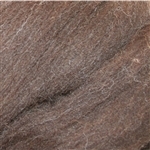 New Manx Loaghtan wool top has a micron count of 28 and staple length is about 3 inches. The Manx Loaghtan (pronounced Manx Lockton) is a hardy mountain sheep, with impressive horns and a dark brown fleece. Four horned rams are particularly striking. The breed takes its name from the colour of its fleece, derived from two Manx words Lugh (mouse) and Dhoan (brown) or from Lhost dhoan (burnt brown). The lambs are born jet black, acquiring the distinctive fleece by the time they are weaned. The Manx Loaghtan used to exist in high numbers on the Isle of Man and across the UK. However by the 1950s there were only a handful left. Today, as with many rare breeds, it is found in a few small flocks around the UK. 60/30/10 Organic Polwarth and Silk Blend - Organic Polwarth and tussah silk - white top 80/20 blend . This is fine Black alpaca top. Is gorgeous cool fiber. An absolute joy to spin. Black Alpaca fiber is silky, lustrous and over dyes beautifully. Huacaya alpaca imported directly from Peru. FS (Fine Spinning) Grade; 25.5 to 26.5 microns. This is fine Brown alpaca top. Gorgeous cool fiber. An absolute joy to spin. Brown Alpaca fiber is silky, lustrous and over dyes beautifully. Huacaya alpaca imported directly from Peru. FS (Fine Spinning) Grade; 25.5 to 26.5 microns. This is fine Silver alpaca top. Gorgeous cool fiber. An absolute joy to spin. Silver Alpaca fiber is silky, lustrous and over dyes beautifully. Huacaya alpaca imported directly from Peru. FS (Fine Spinning) Grade; 25.5 to 26.5 microns. This is fine tan alpaca top. Gorgeous cool fiber. An absolute joy to spin. Tan Alpaca fiber is silky, lustrous and over dyes beautifully. Huacaya alpaca imported directly from Peru. FS (Fine Spinning) Grade; 25.5 to 26.5 microns.